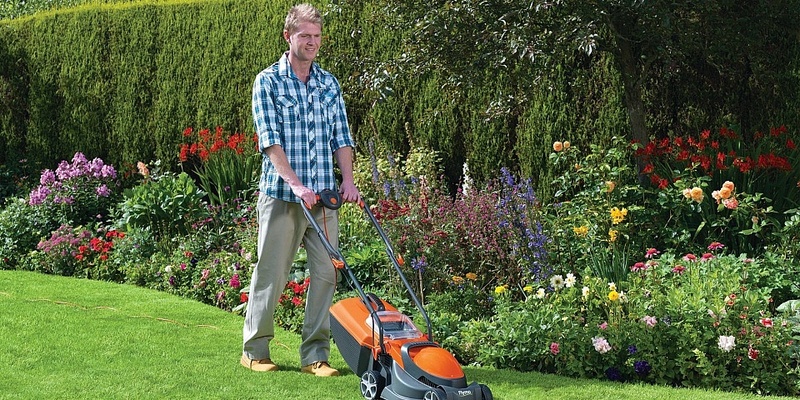 We recently tested the Flymo Chevron 32VC electric which is on sale for less than £100. Read on to find out whether this budget mower is worth considering. If a new electric lawn mower is on your shopping list this year, you might be wondering whether it’s worth splashing out on a premium model, or whether a cheaper mower will make the cut. The Chevron 32VC lawn mower from Flymo is an electric mower suitable for cutting small lawns less than 50sq m. It’s widely available for less than £100 and, at the time of writing, is even listed as Amazon’s Choice. So is it worth snapping up? Flymo, which is best known for its hover mowers, that float on a cushion of air as they cut, are a budget brand that offers a wide range of inexpensive mowers, including electric models. Its mowers tend to be light and simple to use, and are ideal for smaller gardens. What does the Flymo Chevron 32VC have to offer? This lawn mower might be cheap, but it’s got some great specs, making it an attractive option for those on the hunt for a bargain. It’s lightweight, weighing in at a little more than 8kg, so won’t be too heavy to push around. It has a 1200W motor and uses steel blades, which should last longer than plastic blades often seen on cheaper models. There are five cutting heights, starting at 20mm and increasing to 60mm, which are adjusted using a lever. This range of heights means the mower should be able to handle both long and short grass well. It comes with a plastic grass-collection box, which weighs roughly 1kg, and a 10-metre cable. There are some exciting features included too, such as a rear roller, which will help you to get a classic striped lawn, and a grass fill window, which lets you see how much grass has been collected so you know when it’s ready to be emptied. As would be expected with a small mower, the grass collection box is small in capacity, with only enough space to collect 29-litres of clippings. We recently put this electric lawnmower through its paces in our tough lab test. See our full review to reveal our verdict. Should I buy a cheap electric mower? Cheaper mowers are best for those who have a small lawn, as they tend to have smaller cutting widths. Mowers with a larger cutting width will cover ground more quickly – so if you have a big garden, it’s best to go for a slightly pricier model with a cutting width that suits the size of your lawn. Opting for a cheap mower means you’re less likely to get features like a roller or a mulcher, which will finely cut clippings and disperse them back onto the lawn so you don’t need to rake them up. They also tend to have fewer cutting height settings and use trickier mechanisms to adjust the cutting height. Which? Gardening has tested more than 25 cheap electric mowers priced at less than £150 and found a real mix in how well they do their job, with some good enough to be named Best Buys and others leaving us rather unimpressed. We’ve even uncovered one Don’t Buy. Check out our budget electric mower reviews to make sure you don’t end up with a dud.